The piece is five and a half feet tall, and I believe that weighs 200-250 pounds (or more) **67" tall x 30" wide x 21" deep** It is wooden and seems to have had several decorative layers, including apparent previous rose and gold layers underneath. The base and body are more distressed, but the head is in excellent shape. It is huge!! We are told that it is Chinese and very old . There are a few small chips - one on the back and several by the base, that seem to be beyond the natural weathering of the piece (and I have tried to include photos of this minor damage) . We are not eager to sell it right away, but do wish to learn the approximate current value of this piece. Hand painted, glazed porcelain laughing Buddha. Approximately 10" tall x 12" wide x 8" deep. Weighs approximately 7-10lbs. Signed and stamped on the bottom. Excellent condition, no cracks, chips, breaks or fading. 8.5" x 4" x 7.5"
Heavy black stone hand carved with a gold foil type material on it's face. Has makers mark in ear. This has been rolling around in the back of a car by previous owner who didn't know what they had found, so it's very dirty and beat up. eleven inches by two inches. Material is alabaster, still retains a little of the original paint. Asian (burma....) hand carved statue. 41" tall 12" wide. hand painted. have some cracks in wood. made of one piece of wood with addition of book and pineal gland. Buddhism is one of the largest religions in the world. This religion is based on the teachings and principles of Buddha. The status of Buddha is likened to a god; those who followed him highly revered him. Whether you are a Buddhist or not, collecting symbols and statues associated with the Buddhist religion is quite widespread. The Buddha statues become symbol of peace, inner happiness, self-realization, and harmony. Therefore, these are more than just artistic pieces but also religious artifacts. The facial structure, the poses, and the position of the Buddha that is used for making sculptures or statues are critical in its overall symbolization. Whether you want to invest in them for decorative or religious purposes, it is important to know the value of these art pieces in the market. Each artwork is different. It takes trained eye to be able to assess the difference in each. Bizen sandstone and brown glaze, represented seated against a sackcloth whose end he holds in his left hand, his head resting on his hand, the malicious face. Who Collects Ancient Buddha Art? There are many avid collectors of Buddha sculptures, statues, and other art forms. Most are drawn by the religious component of these objects. However, there are also a few others who are interested with its rich history. Most Buddhist art pieces are over 2,000 years old; therefore, it provides a glimpse into the evolution of Buddha’s teachings over the years. The diversity of Buddhist deities have also resulted in providing several avenues for appreciation and study. Those who develop an interest in Buddha (no matter what type of art piece) are also the ones with appreciation for iconography, ideology, and other universal themes. The history of Buddhism started in India about 2,500 years ago. Therefore, its popularity extends far beyond those who practice this religion. Any artifacts or art forms associated with it are also held of high value. Quality is an essential component when evaluating Buddhist art. 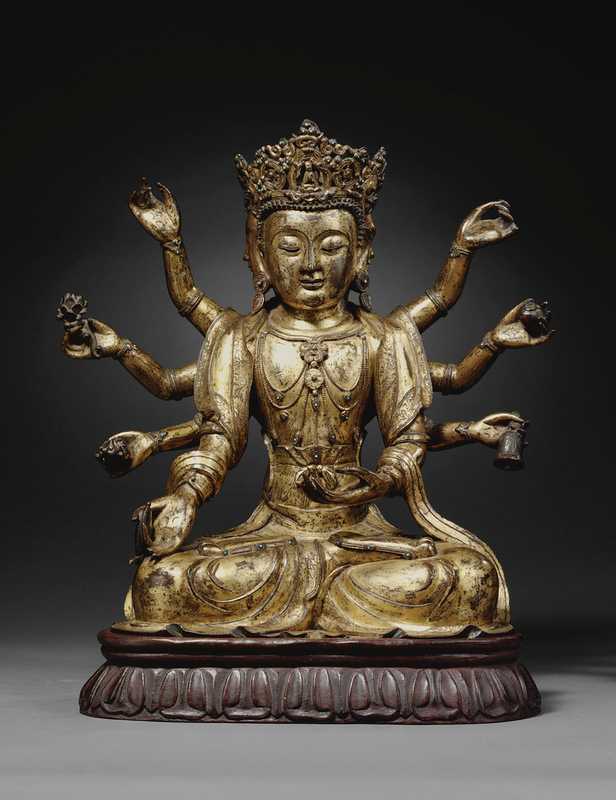 There are a number of factors that determine quality for a Buddhist art. These factors could be anything from the stylistic modeling for the sculpture or statue, skill of the artist, and the rarity of the object. Sculptures comes in many different styles and some people prefer different styles, but the quality is an essential factor when determine the value of the sculpture. People are buying Buddhist art since they exhibit skilled craftsmanship. The quality, as with any type of antique, can be a significant factor that would impact the price of an item. An antique item that has a well-documented provenance is going to be valued higher than a similar work with no recorded history or provenance. A documented provenance can also verify the authenticity of the object. Hence, it will further support the object’s value and enable you to sell it for a price that reflects its actual market value. In addition, it is also important to understand the laws and protocols associated with the sales of ancient works. Buddhist arts are bounded by international laws so you need to make sure that the item in your possession is not prohibited to be sold outside of its country of origin. How About the Overall Condition? Condition is of key importance when collecting art. It has a direct impact on value and should therefore be considered when buying or selling art. Given that most Buddhist art pieces are antique, some might not be in top condition, realistically speaking. If you have an item that has been restored, it is important to consult a specialist to determine how much of the value of the work was preserved in the process. There are plenty of replicas of Buddha statues and sculptures out there. When these replicas are made, they are created with the help of published references. Therefore, the front and back of the statues or sculptures are copied but not all the details. An expert in antique Buddhist art can decipher the authentic art piece versus one that is a replica only. The design components from the original artwork also contains signature from the artist. Therefore, a professional appraiser will look for any signature from the artist to determine its authenticity. In the absence of the signature, it will be difficult to guarantee the item’s value. However, the signature can cause an item’s value to significantly double, or triple depending on the other factors that are linked to its value. Always take good closeup photos of the back and at the bottom of the sculptures. The appraiser will look for inscriptions and other interesting marks that can tell the date of when it was created. Valuing antique items such as ancient Buddha statues and sculptures is always a challenge, even for expert appraisers. Several factors are taken into account to determine its market value. To begin with, the historical period from which the art piece has originated from, the style, and the culture have a direct impact on its valuation. As already mentioned above, the provenance and quality, along with any presence of signature from the artist, can significantly increase the value of the antique piece. If there is any form of documentation associated with the art piece, they can be a significant addition in your effort to authenticate its value. There is a universal appeal and demand for Buddhist art. Therefore, it is not surprising to find collectors who are seeking them. If you own one and wish to make money off of it, it is important to determine the value of your antique piece. Mearto has experienced and professional appraisers who can help you with appraising these antique items or any types of antique Asian artworks. Make sure you provide proper documentation for the antique items to support the authenticity and rarity of the object. If you get a high valuation on your buddhist sculpture, it is important to bring it in to a local appraiser or an auction house so an exact value can be set.